Our graduates work at Caterpillar, Deere & Company, Deloitte, RSM Global, HNI Corporation, and many others. Small class sizes, expert faculty with real-world experience, and internship and networking opportunities you won't get at a larger university. Our location and relationships with Fortune 500 companies give you a big edge in the business world. As an accounting major, you will learn U.S. and international accounting standards and be able to plan, coordinate, and control the financial activities of businesses at a bottom-line level. Internships in your junior or senior year will place you directly in the business world, where you apply what you've learned. The Quad Cities supports many world-class accounting firms and companies including Deloitte, RSM, Modern Woodmen, and HNI (HON). Our students have grown their skills as interns at Deere & Company's worldwide headquarters and been hired for its elite career development program. What's more is that at SAU, you get an education based in the Liberal Arts, and your general education courses help you develop strong inquiry, communication, and writing skills – something employers tell us they love about our student interns and graduates. What makes SAU's accounting program unique? At SAU, our location is a huge advantage and gives you opportunities to intern with world-class accounting and Fortune 500 firms. We have established relationships with firms and companies including Deloitte, RSM, Modern Woodmen, and HNI (HON). Our students have grown their skills through internships at Deere & Company's worldwide headquarters and some were hired for the company's elite career development program. You can participate in internships during the spring, summer, or fall. 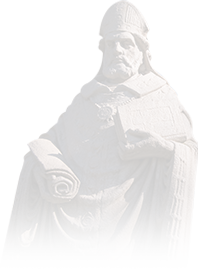 As an Ambrosian, you can gain practical accounting skills and help others. In the spring of 2018, students taking Accounting seminar provided free tax preparation for low-income tax filers through the Volunteer Income Tax Assistance (VITA) program. This is just one of many service learning and volunteer opportunities you have as an SAU student. 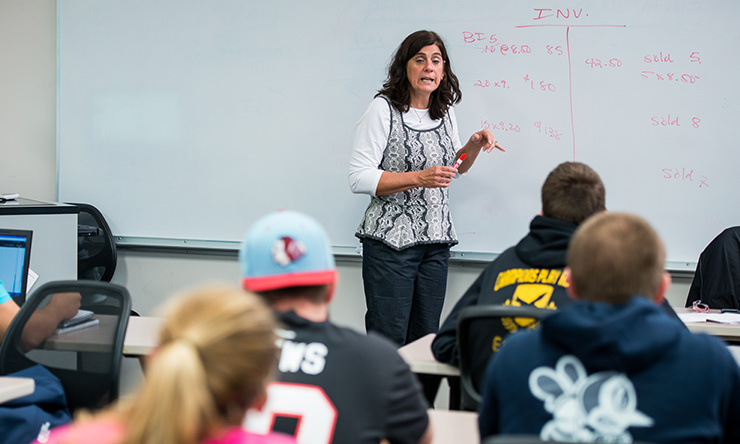 We are proud of our 12:1 student-to-faculty ratio, which means you will enjoy small class sizes and a lot of attention from accounting professors, not teaching assistants. In fact, at SAU you can expand your learning by working individually with faculty through work-study positions. At SAU, you can major in accounting and earn your master's degree in just five years. If you maintain a 3.0 undergraduate GPA, that automatically qualifies you for admission to the MAcc program. Even in graduate school, you will continue to enjoy small class sizes and learn from professors you know (and who know you, too). You have abundant choices. Accountants can specialize in public accounting, conducting audits and tax planning for CPA firms. You can work for corporations such as Deere & Company doing cost, financial or international accounting or internal auditing. Others choose governmental accounting positions at the federal, state or city level, taking on roles with the FBI, IRS, or as a bank examiner. Some accountants use their expertise in nonprofit agencies such as United Way or Red Cross. Other career options include working as a tax specialist, forensic accountant, controller, chief financial officer, financial planner, and international accountant. Our Career Center will help prepare you for life after college, and that includes lots of job prep such as creating a résumé, writing a cover letter, learning how to have a successful interview, and more. If it's graduate school you're aiming for, preparing an application and interview are also part of their services. After earning his undergraduate accounting degree in 2008, John Hammar stayed at SAU for a master's degree in accounting in 2009. He is now an audit manager at Deloitte in Cedar Rapids, Iowa. Katie Zorn '15 was a rare triple-major in Accounting, International Business, and Theology. She works as a Cost Accountant for HNI in Cedartown, Georgia. This is the suggested plan of study to graduate in four years with a degree in Accounting. This plan assumes the student has not taken three years of foreign language in high school. *Needs prerequisite. Check the Course Catalog for details. 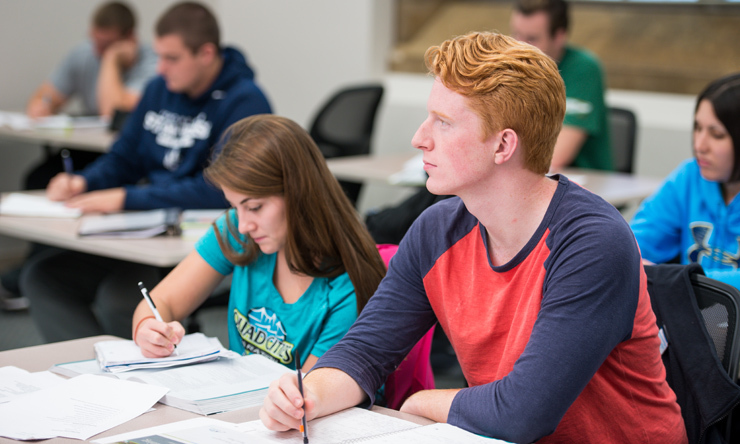 Our accounting majors are eligible for several special scholarships and financial aid – more than $40,000 in scholarships are awarded each year. Students must re-apply every academic year. Derrek Drexler Accounting Scholarship – available to full-time (at least 12 hours) accounting majors with at least a 3.0 GPA on a 4.0 scale. Preference given to graduates of Wahlert Catholic High School (or any Catholic high school); college juniors or seniors; and those involved in student activities and/or Wellness and Recreation. Edward R. Frick Accounting Scholarship – available to full-time undergraduate and graduate accounting majors with at least a 3.25 GPA on a 4.0 scale. The scholarship is based on financial need with the preference that applicants be Hispanic and/or active in athletics and/or student activities. Shapley Accounting Scholarship – for graduate and undergraduates. George Till Scholarship – available to full-time students with at least a 3.5 GPA on a 4.0 scale. The Scholarship is based on financial need, academic ability, and varies from $500 to $4,000 per year. Van de Voorde Accounting Scholarship – available to accounting majors who have financial need. Wahl Accounting Scholarship – available to undergraduate accounting majors who have a GPA of 3.0 on a 4.0 scale. There are also jobs and work study opportunities throughout campus. Work study will be indicated on your financial aid award letter, and you can apply for campus jobs through the Career Center. Keep in mind that 98% of First-year students receive financial aid from St. Ambrose!